"Sampath Speaking" - the thoughts of an Insurer from Thiruvallikkeni: mother fined for eating bananas on wheel ! Bananas are one of most liked and most consumed fruits ~ a banana peel, known as a banana skin in British English, is the outer covering of the banana fruit. Banana, that delicious fruit is the common name for herbaceous plants of the genus Musa and for the fruit they produce. The area closer to Triplicane – the congested Zambazaar, is a prime market place for bananas. Have seen banana plantations alongside river Tamarabarani as also around Kaveri in Trichy. In Tamil Nadu, eating in a banana leaf is fulfilling and traditionally food is served on big banana leaf on ceremonial occasions. You could have heard of the ‘toungue twister’ ~ “வாழைப்பழ தோல் வழுக்கி வாலிபர் உயிர் ஊசல்” (‘Vazhaipazha thoal vazukki vaalibar uyir oosal’) – in Tamil you have this ‘zha’ (ழ) uncommon to other languages and not many pronounce this too well [you hear of them so often in TVs and Radios]. People may never get bored of eating a banana but could be bored of ripping it open without messing it all over. Away in Dorset in UK, a mother who ate banana at the wheel was treated like a criminal and fined £100. The 45-year-old was quoted as saying 'This is the most expensive banana I've had in my life' ~wonder why, read this report from Mail Online. A single mother who was caught eating a banana at the wheel while stuck in gridlocked traffic has moaned she was treated 'like a criminal' after being fined £100. Elsa Harris, who works as a carer, was pulled over while driving to work along a gridlocked road in Christchurch, Dorset. 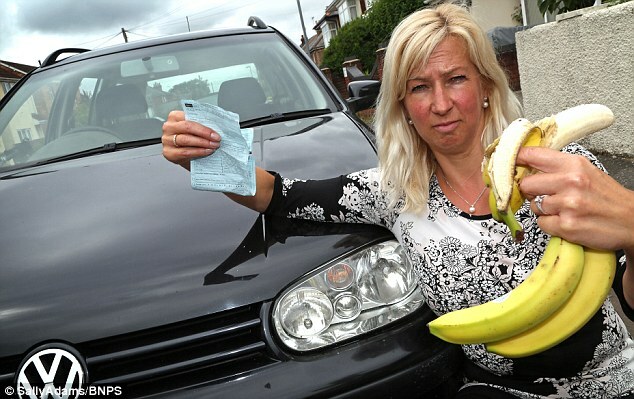 She was handed the fine and given the choice of either three penalty points or completing a driver awareness course after admitting taking her hands off the wheel momentarily to peel the banana. The 45-year-old, who insists her car was stationary in a traffic jam when she the incident occurred, has now blasted the fine as 'ridiculous'. She said: 'I'm a single mum. This is the most expensive banana I've ever had in my life.' Ms Harris said she had already peeled the banana at home, but there was a small piece of skin still needing removal before she could eat it. She said: 'An unmarked blue car started flashing at me, drove in front, then slammed its brakes on. It caused so much confusion with all the other cars, nobody knew what was going on. 'When the officer got out he was really angry from the offset, but I was still completely unaware I'd done anything wrong.' Ms Harris said she's never been in trouble with the police before and has no points on her licence. She said: 'The officer said I was driving without my hands on the wheel and was a danger to other drivers, but I said that was rubbish. 'I'm a carer and work at vulnerable people's homes serving them lunch. We don't stop for lunch ourselves, we don't get lunch breaks. Normally we have to eat on the hoof. Eating while driving is not a specific offence. However, anyone distracted behind the wheel or failing to operate their vehicle correctly because they are eating could be committing an offence of driving without due care and attention, or not being in proper control of a vehicle. The Highway Code states drivers should avoid distractions such as eating, drinking, loud music, trying to read maps, smoking, and arguing with passengers or other road users. 'Our traffic officers and No Excuse team use enforcement and education to tackle the 'fatal five' - drink and drug driving, excessive and inappropriate speed, not wearing a seatbelt, careless driving and driver distraction. 'We educate people at the roadside and through the driver awareness course to highlight the potential consequences of their actions.' – says the Police.